Animals living in group can have different preferences about where to go and what activity to do. However, individuals have to reach a consensus and take decisions as a whole, or the group will split. In some animal species, group decisions are mediated by active signalling and communication. This is the case for instance of honeybees, which "dance" to communicate the position and quality of a potential nesting site. In other animal groups, such as birds and fish, decisions are reached through movement interactions: a bird turns to the right because its neighbour moves to the right. This is a much simpler mechanism than honeybee dances, but its simplicity makes even more interesting the question how these groups can reach consensus about a common direction of movement, even when different members have conflicting preferences. Homing pigeons are known for their ability to fly back home from distant destinations. This is an ability that they can refine with experience, and a pigeon released several times from the same site will learn a stereotyped route back to the loft. When multiple pigeons fly home together, a conflicting situation arises, whereby each individual aims at following its own preferred route, but they also want to stay with the group. By attaching small GPS loggers to the feathers of these birds, Benj Pettit could track the paths of pigeons flying alone, and in small groups. 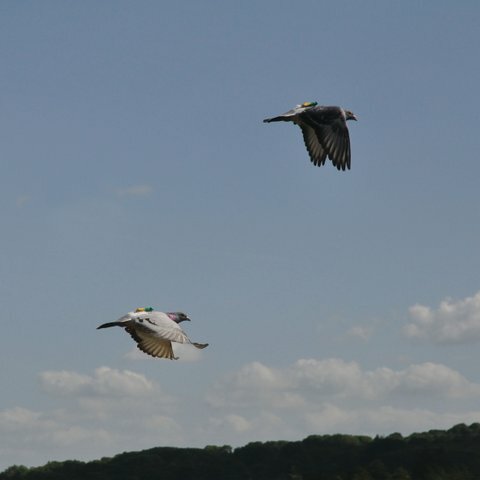 The relatively good accuracy of GPS data opens the possibility to study how group decisions (in this case the decision of a common route) emerge from birds’ momentary responses to each other and to the environment. In our experiments, birds were flying side by side most of the time. This side by side configuration likely favoured bi-directional exchange of information and shared decisions about a common route. However, occasionally one of the birds occupied a position slightly in front of its neighbour. Our analyses showed that pigeons that flew faster when flying alone were more likely to occupy positions in front of their neighbour when flying in pair. In addition, the individual in front had a greater influence on the movement of the group: whenever the bird in front turned to a new direction, it was more likely to be followed by its partners.